“Before I saw your book, I was resigned to putting my longer term money into CD's and government agency debt. Now I buy preferreds from the CDx3 Bargain Table and set my profit target via the CDx3 Seller's Calendar...In the interim, I collect the dividends. It's a perfect fit!” - Carl J. Welcome to all of the new CDx3 Newsletter readers who signed up during January. This is your first issue of the CDx3 Newsletter, a free monthly newsletter devoted to the interests of CDx3 Preferred Stock investors. As compelling and historic as the events going on within our financial industry are, do not forget that there are some real bargains waiting to be had with preferred stocks issued by non-banks. The turmoil in the financial industry has pushed the market prices for the highest quality preferred stocks ("CDx3 Preferred Stocks") from non-banks down as well, creating some spectacular diversification opportunities for buyers. In the Last Month's CDx3 Investor Results article I provide you with an update on the performance of the CDx3 Preferred Stocks issued by The Protected Fifteen banks (down from sixteen due to January's bank mergers) - now up 35% since the TARP program began. But I also break down the various non-bank industries that are represented by CDx3 Preferred Stocks - the highest quality preferred stocks available with annual yields over 11%. In the Special Announcement article I identify the three options that, according to Reuters, the government is pursuing for TARP 2. This initiative will shape the marketplace for preferred stock investors going forward. I will be sending you an update later this month once the details of TARP 2 are announced. The CDx3 Company Spotlight article this month is on AMB, one of the many non-bank issuers of CDx3 Preferred Stocks that I have spotlighted for you over the last several months. While not a household name, it is almost a certainty that each of us has something in our homes that has spent time in an AMB facility. An interesting company that has helped integrate the world's economies with their high-tech facilities. When dividend rates come back down from their current historic high of 8.95%, and market prices head back up accordingly (this is the Rule of Rate/Price Opposition from my book Preferred Stock Investing) the marketplace for CDx3 Preferred Stocks will return to a "seller's market." This month's CDx3 Question Of The Month article describes the Target Sell Price and answers the question "...at what price am I better off by selling, rather than holding onto my CDx3 Preferred Stock shares and collecting more dividend income?" The Free Special Offer article below provides you with a download link to what could be the most important document you will read during this global credit crisis. As a reader of this monthly CDx3 Newsletter, you obviously have an interest in preferred stock investing. This newly published report is titled "Quick Guide To Preferred Stock Investing During A Global Credit Crisis" and is available to my readers for free (see the link in the Free Special Offer article below). While we're all anxious to hear the details on TARP 2 later this month, do not let the opportunity that this credit crisis has created with non-bank CDx3 Preferred Stocks pass you by. Subscribers to the CDx3 Notification Service receive a report every month that identifies non-bank CDx3 Preferred Stocks that are at a point in time that, the research shows, tends to favor buyers. Once TARP 2 is unveiled later this month, I will report back to you regarding how I see the program's provisions affecting the marketplace for CDx3 Preferred Stocks. We’ll know more about TARP 2 within the next couple of weeks, but it is looking like the government is going to use TARP funds to shelter banks from the toxic mortgage-backed investments that are preventing normal lending. While we do not know, as I’m writing this, what form TARP 2 is going to take, I can tell you that the market prices of the CDx3 Preferred Stocks* involved in TARP 1 have now risen an average of 35% since the day before TARP 1 was announced last October 6. Here’s an updated chart from the one I showed you last month (see last month’s chart). Notice that, due to January’s merger activities, The Protected Sixteen banks from last month have now become The Protected Fifteen. Media reports over the last few weeks have pointed out that the common stock market prices of many TARP banks have fallen since receiving TARP funds. That may be, but I think this chart makes it pretty clear that these particular CDx3 banks - The Protected Fifteen and their 31 CDx3 Preferred Stocks* - are receiving much more favorable treatment from The Market. And the CDx3 Selection Criteria* have picked them out of the pile of several hundred pretenders. By the way, the yellow highlighted bars are issues from Citigroup and Bank of America. These two banks had a very tough January, primarily Citigroup. But did you notice that Citi’s January 16 announcement that they were going to be separating their toxic assets into a separate company and the government’s announcement of forming a “bad bank” within which to hold toxic assets from banks were made simultaneously? Coincidence? I don’t think so. If TARP 1 pushed the average market price of these 31 CDx3 Preferred Stocks* up 35% in just four months, what do you think is going to happen once TARP 2 is implemented? We’ll have to see what restrictions TARP 2 places on these banks. But the program has the potential to go a long way toward stabilizing our financial system. In the meantime, preferred stock investors may also want to consider high-quality preferred stocks issued by non-banks. 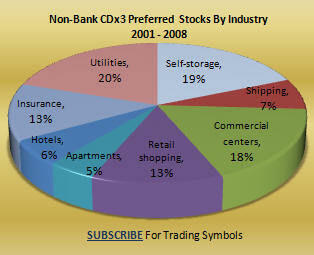 Diversification: One way to avoid the turmoil related to banks is to look at non-bank CDx3 Preferred Stocks*. CDx3 Preferred Stocks are issued by a wide variety of businesses; in fact, during all of 2003 and 2004 (pre-credit crisis) there were no CDx3 Preferred Stocks issued by banks at all for over two years. By considering non-bank CDx3 Preferred Stocks*, you receive all of the risk-lowering benefits of the ten CDx3 Selection Criteria without investing in banks. Remember, the CDx3 Selection Criteria (Preferred Stock Investing, Chapter 1) have successfully filtered out every failed bank since this credit crisis began. 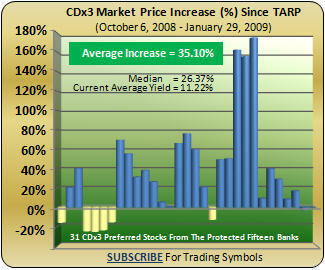 All dividends have been paid to CDx3 Investors on time and in full. Don’t forget that, as nasty as a down economic cycle can be, there are those that benefit. This housing-fueled recession in particular has benefited apartments and self-storage businesses, for example. When the economic pendulum swings to the up side, retail shopping, hotels and shipping businesses benefit from the uptick (which means that there may be bargains available in these areas right now). Every month, subscriber’s to the CDx3 Notification Service receive the “CDx3 Bargain Table” (what’s this?) that identifies CDx3 Preferred Stocks* from a variety of industries that are at a point in time when, research shows, their market price will tend to favor buyers. We do the research and work for you and provide you with a list of CDx3 purchase candidates each month for your consideration. 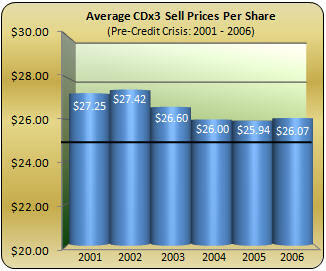 Several non-bank CDx3 Preferred Stocks* are featured on the current CDx3 Bargain Table. If you are looking to diversify your investments into the highest quality preferred stocks issued by non-banks, please consider subscribing to the CDx3 Notification Service (see pricing). You are going to be hearing from me again in the middle of February. As tired as we all are of reading (and writing) about banks and the government’s efforts to unlock the gridlock in the credit markets, the fact is that our economy is not going to pull itself out of this mess until banks start lending again. With their balance sheets bogged down by these mortgage-related toxic assets (investment instruments backed by homes that have lost their value and mortgages that borrowers have defaulted on), banks absolutely cannot take on any more risk – not one pinch. Put another way, they cannot issue any new loans except under the very safest of terms to the very best of borrowers. Otherwise, no more loans. And that's where we've been at since June 2007. The TARP program was originally supposed to get these toxic assets off of the balance sheets of these banks, freeing the banks up to take on new risk (i.e. make new loans). But, in the 11th hour last fall, Treasury changed course and injected cash into these banks by purchasing custom-made preferred stocks from them instead. With TARP 2 now upon us, it appears that we are heading back to Treasury’s original proposal for TARP funds – use the money to isolate the banks from these toxic assets in order to free up lending. TARP 2 has the potential to deal with many of the issues facing our economy. While its provisions are still unknown, the government has been pretty clear about their objectives. 3. further capital injections by the government into banks, although with new requirements on the usage of such funds (ala TARP 1). The bad bank scenario is getting a lot of mention, especially since the other two options have already been tried in one form or another. Like it or not, TARP 2 and the other programs that will come along with it, is driving the preferred stock market right now. As one interested in preferred stock investing, you should pay close attention to what happens with respect to the government’s plans for TARP 2 later this month. You know I will be. As important as this is to preferred stock investors, please expect an update to this issue of the CDx3 Newsletter from me in a couple of weeks. Have questions? Subscribers to the CDx3 Notification Service have direct access to me and my ongoing preferred stock research by using my special email address. If you are serious about preferred stock investing, please consider subscribing to the CDx3 Notification Service. If your local mini-storage operator does not have enough storage space for your stuff, you might try calling AMB Property Corporation, headquartered at Pier 1 in San Francisco, California. AMB, founded in 1983, is a $1.6 billion company that specializes in the ownership and operation of industrial distribution and storage facilities - 160 million square feet of it, spread across about 1,200 buildings in 15 countries. AMB's facilities are specifically located in cities throughout the world that are, or are near, major transportation centers. AMB builds high-tech facilities with a specific emphasis on quick-in, quick-out handling of high volume cargo near airports, seaports and ground transportation centers. AMB's facilities were 95.1% occupied as of December 31, 2008 with an average occupancy of 94.9% throughout 2008. "During the fourth quarter of 2008, the company leased more than 2.2 million square feet of its development pipeline, bringing the full-year total to a new annual leasing record of approximately 8.3 million square feet compared to approximately 8.2 million square feet of development leasing in 2007. Customers that initiated and expanded their relationships with AMB in 2008 range from global consumer brands to third party logistics and air freight forwarder companies and include: 3M, DHL, Dorel, KLM, Kuehne + Nagel, Pepsico Canada, Schenker and Wincanton." Click here to learn more about AMB Property Corporation, issuer of CDx3 Preferred Stock. What is the Target Sell Price and how do I use it? - Paula G.
The answer, of course, depends on the price that you can sell your shares for. But at what market price are you better off by selling rather than holding? For those who haven’t had to make this calculation since high school, answering that question can be a real hair-puller. By using the Target Sell Price from Preferred Stock Investing, the calculation is done for you. All you have to do is, on a certain date when the market price of a CDx3 Preferred Stock is likely to favor sellers (explained in Chapter 6 of Preferred Stock Investing), check the market price of your CDx3 Preferred Stock. If the market price is greater than the Target Sell Price on that day you should consider selling. I’d like you to keep the following question in mind as you read the rest of this article: if I were to offer you $1.50 now or give it to you nine months from now (no strings attached), would you rather have the money now or later? Let me give you an idea of how the Target Sell Price works. Let’s say that you own a CDx3 Preferred Stock that pays an 8% annual dividend. Since CDx3 Preferred Stocks always base your dividend payments on a value of $25.00 per share (regardless of the current market price and regardless of what you actually paid to buy it), you are going to earn $2.00 per year on this CDx3 Preferred Stock for every share that you own. For this example let’s say that you purchased this 8% CDx3 Preferred Stock for $25.00 per share. Since CDx3 Preferred Stocks pay dividends quarterly, you are going to receive a check for $0.50 per share every quarter for your 8% CDx3 Preferred Stock. Another thing we know about the market price behavior of CDx3 Preferred Stocks is what Preferred Stock Investing refers to as the Rule of Rate/Price Opposition. As the dividend rate being offered by new CDx3 Preferred Stocks increases, the market price of older lower dividend payers will tend to decrease. And the opposite is equally true – when new issues are offering lower dividend rates, the market price of older higher payers will tend to go up. Rates up, prices down and vice versa – the Rule of Rate/Price Opposition. So, as dividend rates on newly issued CDx3 Preferred Stocks go up and down over time, their market prices fluctuate accordingly. During a “seller’s market” for CDx3 Preferred Stocks, when dividend rates are decreasing and market prices are increasing, it would be very unusual if the market price of your 8% CDx3 Preferred Stock did not far exceed its par value ($25.00) as dividend rates fell below 8%. For example, if dividend rates were to fall to, say a more normal 7%, your 8%-er is going to be a hot ticket, and its market price will tend to go up accordingly. So the question becomes this: if the market price of your 8% CDx3 Preferred Stock rose from the $25 per share that you originally paid for it to, say, $26 per share, would you sell it? If you did, you would make a $1.00 per share capital gain. Remember, your 8% CDx3 Preferred Stock pays you $0.50 per quarter, so selling for a $1.00 capital gain is equivalent to two quarters worth of dividend income – and you’ll receive it all at once, the moment you sell. You won’t have to wait for two quarters in order to get your money. What if the market price went to $26.50? You would make a $1.50 profit for every share. That’s three quarter’s worth of dividend income right now; no waiting another nine months to receive the same amount. Would you sell for $26.50? This is the question I asked you earlier – would you rather have $1.50 now or $1.50 later? CDx3 Investors use the Target Sell Price as a guide during a seller’s market (characterized by high market prices and low dividend rates). In cases where the market price of your CDx3 Preferred Stock exceeds the Target Sell Price (on the specific date that is explained in Chapter 6 of Preferred Stock Investing) CDx3 Investors consider selling. Note that we have been in a "buyer's market" since June 2007 when the current credit crisis set in. Selling 2007 and 2008 CDx3 Preferred Stocks will come later once dividend rates come back down and, correspondingly, market prices come back up. The individual CDx3 Preferred Stocks issued since January 2001 used for this chart are itemized, along with the sell date, sell price and effective annual return that you would have earned, in Chapter 9 of Preferred Stock Investing. Thanks to Paula G. for the great question. You will receive a free copy of the CDx3 Special Report "Dividend Accounting." The 18-month long credit crisis has shaken our financial system and everyone who is invested in it (which is just about everyone). Even though the CDx3 Selection Criteria, day after day, have successfully filtered out every failed bank for over a year now, and even though there has not been so much as a missed dividend for those who have invested in CDx3 Preferred Stocks, there's still some anxiety. The market prices of the 31 CDx3 Preferred Stocks issued by The Protected Fifteen TARP banks that I have been identifying for you over the last few months are now up 35% since the TARP program was announced. While these CDx3 Preferred Stocks are obviously thought of more highly by The Market than others, the next big milestone for these high quality preferred stocks will come later this month when the details of TARP 2 are announced. In the meantime, preferred stock investors should not become so focused on the historic events within our financial sector that they ignore what is now an equally historic opportunity to diversify your portfolio with the highest quality non-bank preferred stocks. The current yield being offered by CDx3 Preferred Stocks from non-banks is over 11% and there are plenty to pick from (see the pie chart in the Last Month's CDx3 Investor Results article at the top of this newsletter). You will hear back from me later this month once the government formalizes TARP 2 and its affect on the marketplace for CDx3 Preferred Stocks becomes more clear. Remember, I'm not a stock broker; I'm not trying to sell preferred stocks to you; and I don't sell investment advice. I'm an investment researcher with an economics and statistics background who has developed a simple way to earn a respectable return at acceptable risk. And I've written it down in Preferred Stock Investing. I'm hopeful that you find these monthly CDx3 Newsletters interesting, and will consider learning more by purchasing my book, Preferred Stock Investing or by subscribing to the CDx3 Notification Service.